Fred Brush (1889-1972) was a gardener from a village near Tewkesbury when he enlisted in the army in 1911. 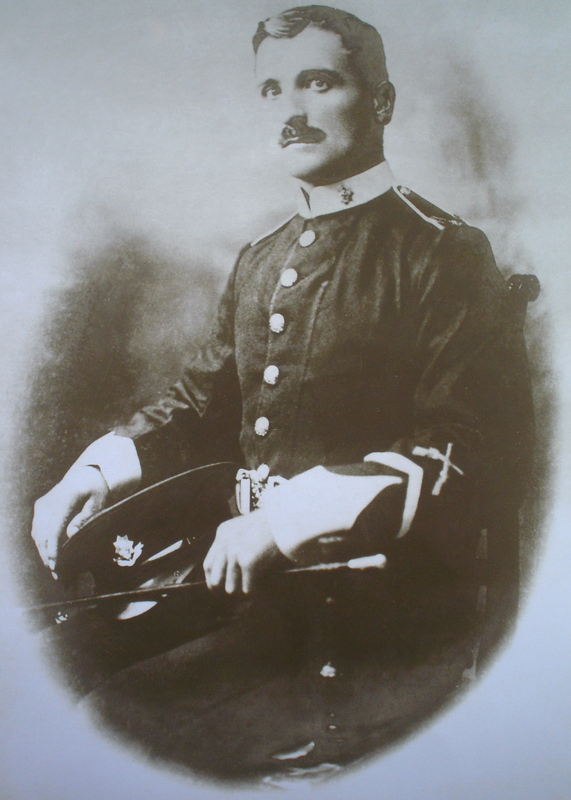 He served with the 1st Worcestershire Regiment, first in Egypt and then as part of the British Expeditionary Force that went to France in 1914. A marksman and bandsman (he played the trombone), he was shot in the chest in June 1915, the bullet lodging so close to his heart that it could not be removed. He returned home to recuperate and met 18-year-old Margaret Baldwin from Hanley Swan. Six months later they were married in St Gabriel’s Church, the first military wedding to be held there. Her wedding dress was made by Mrs Wallace Williams of Church End. Margaret (1896-1950), like her sisters Nancy and Florence, was born at The Roses, Ewe & Lamb green, as her father, John Baldwin (b. 1863), a rough carpenter, had been before her. Her grandfather, James Baldwin (b. 1821), a sawyer, had moved into The Roses from Blackmore Park, where her great-grandfather, Richard Baldwin (b. 1794), and great-great-grandfather, Aaron Baldwin (b. 1760), had worked on the estate. Fred went back to the front in 1916 and was again wounded in action – shot in the right arm, left leg and back and had two toes blown off. Finally, in the Battle of the Somme where the British army suffered its heaviest causalities ever in one day, he lost his right arm. Then he was employed as an orderly for 5 months before being discharged as “no longer physically fit for war service” in 1917. Fred returned to Hanley Castle, where he rented a cottage on the edge of Cliffey Wood from the Lechmere estate, working at Cliffey Farm and Sink Farm until the outbreak of the Second World War. He and Margaret had four children: Nina (1916-2003), Lucy (b. 1918), Fred (1921-2001) and Nancy (b. 1923). The rent for their cottage was 13s a month, a figure that remained unchanged for 40 years, during which time its value fell from the equivalent of £25 today to just £10. Eventually, in 1958, the rent went up to £2 8s 8d a month (£38 today) and stayed at that level until Fred went into a nursing home in 1970. Throughout his 53 years at the cottage, there was no running water or electricity. The family would pump their water, use a toilet at the bottom of the garden, cook on a paraffin stove and light candles to go to bed. Fred kept two pigs, every year selling one and keeping the other for the family, but he wouldn’t stay around when it was killed; his wife and daughters saw to that. They called in the Hanley Swan butcher, Frank Jarrett, who would cut it into sections to be hung in the cottage until needed. Nancy and her brother and sisters attended St Mary’s primary school in Roberts End, near the Cross Hands junction. Her earliest memories are of going with her grandfather to collect his weekly jug of cider from the Ewe & Lamb. She also remembers walking with her father to collect his weekly wage in 1930 – £1. Hers was a happy childhood, cycling around the village and playing football and cricket in a field opposite the family cottage. Once a year, as a special treat, she and the other children would be allowed to travel in the cart owned by Mr Toomey, the coal merchant who lived opposite Hanley Swan village stores, to Malvern for sticky buns and lemonade. Granddad would give her a penny for sweets. During the war, her father Fred became the Hanley Swan postman, sorting and delivering letters despite his handicap. To compensate for no longer being able to play the trombone, he whistled everywhere he went and people would know the time of day when they heard him coming. Nancy married Phil Hedges (1917-1971), who became a barber. Every Sunday they would attend a packed St Mary’s Church, where Phil served at the altar, and a choir of up to 20 sang. She remembers that Laundry Cottage in Bowling Green used to take in laundry for the Lechmere family, while Laburnum Cottage in Hanley Swan did the same for the big houses in Roberts End.